LOS ANGELES, Oct. 24, 2016 /PRNewswire/ -- Walter O'Brien, the founder and CEO of "Think Tank for Hire" Scorpion Computer Services, Inc. was recognized by the City of Los Angeles at the US Global Business Forum Luxury Lifestyle Event for his contributions to World Peace. For the 3rd time in 18 months O'Brien has received a commendation from the Mayor's office, this time for his work promoting World Peace and invaluable service to the Los Angeles community. The City of Los Angeles red carpet and award-banquet ceremony was sponsored by Samira's Network (KSCI-TVLA18 reaches 5.6 million households), Ravi Tilak (The CEO of Almax USA), Larry Namer (Founder of E Entertainment), and Mary Apick International award-winning actress and Human Activist, Said Faraj. The ceremony was hosted by Kaya Redford, the Fortune 500 executive coach to New York Life, Bank of America, Century 21, Xerox, Keller Williams, Remax, Aflac, NuSkin, ACN and NAWBO (National Association of Women Business Owners). 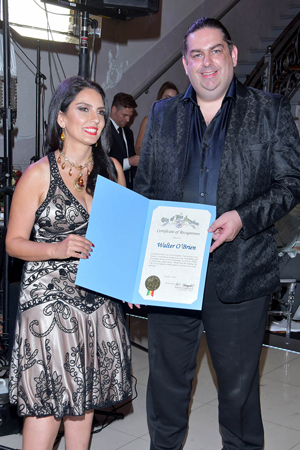 The award to Walter O'Brien was presented by Los Angeles councilmember, Bob Blumenfield and Samira Kazemeni. Regarding the award Samira Kazemeni personally introduced Walter by saying, "years ago the self made billionaire donated his time for free to give her honest business and life advice that changed her life and business significantly for the better. Walter O'Brien exemplifies the spirit of doing good in the world, with a recent award from the defense industry for saving countless lives. He's also among the most generous with his time promoting STEM subjects and computer science while teaching kids that 'being smart is cool.'" Walter O'Brien is the founder and CEO of Scorpion Computer Services, Inc., and CEO of Scorpion Studios. He is the Executive Producer and the inspiration behind the hit CBS television drama, Scorpion, with over 26 million viewers. The U.S. Department of Homeland Security has certified Walter O'Brien as being a person of national interest to the United States and granted him an Extraordinary Ability EB 1-1 Visa. He has worked with the U.S. Department of Homeland Security, Navy and Air Force systems to deploy artificial intelligence that protects American military personnel and civilians. In addition he has worked with multiple Fortune 500 companies including the world's largest mutual fund, Fujitsu, Trados, Oracle Corporation, Baltimore Technologies and Critical Path. O'Brien serves as chairman or board member for Strike Force Solutions, Talentorum Alliance Houston Technology Center and Lawloop. O'Brien regularly donates his time to charities and the community in general to encourage all generations to celebrate intelligence. He is a frequent media commentator, public speaker and radio show guest. O'Brien provided the seed funding for TaxiWatch, a suicide prevention program that has saved over 100 lives since its inception in 2015. Also in 2015 O'Brien contributed to the next XPRIZE selection as part of the XPRIZE Visioneering team. Samira's Network (KSCI-TVLA18 reaches 5.6 million households) is an award winning international variety show hosted by the crowned beauty queen and jewelry designer Samira Kazemeni. Samira's Network is an award winning international variety show hosted by the crowned beauty queen and jewelry designer Samira Kazemeni. Samira's Network is an International Variety Talk Show that airs every Friday at 12:30AM after midnight on KSCI channel 18, also reruns several times during the week in other networks such as International satellite. Samira's Network brings celebrity interviews, actors, designers, producers & directors, medical doctors, attorneys, politicians, inventors, musicians, martial arts, athletes, artists, magic shows, beauty queens & pageants and great chefs who even cook live on the show. Samira's Network also features a broad assortment of entertainment including: health & beauty, also celebrities coverage on the red carpet, fashion shows and charity events.